Things that are every bit as great happen every day in scientific labs, and no one cares. Maybe as a society we’ve become anesthetized to science — when really, it’s so exciting. We have so much to gain as a country if we invest in science and knowledge and understanding. I don’t blame the public for not understanding, though, or even legislators for sometimes not wanting to invest. They all look so much like my family. There are several science-y details in this interview that really startled me; Our knowledge of embryo development is vastly improved since last I looked. …but mostly I just like the sentiment of wonder she expresses. “When is the last time I learned something new?” is a question I try to update the answer to every day. The annotated version of the visualization (shown above) highlights the GEOS FP model’s output for aerosols on August 23rd, 2018. On that day, wildfires caused huge plumes of smoke to drift over North America and Africa, three tropical cyclones took place in the Pacific Ocean, and high winds over the Sahara caused wind-borne dust particles to fill the sky. All of these produced aerosols which are represented in the visual by different colors. I’m not sure if I’m more impressed by the beautiful composite photo and the science that went into it, or if I now just want to never inhale again. So basically all of these systems are intimately interconnected, and probably before this is done with researchers will find five more systems intimately interconnected with all of these. It might be that inflammation is the master system which causes a cascade of events in all of the others. It might be that one of the others is the master system. It might be that depression is a collection of multiple different diseases, and some are caused by one thing and others by another. It might be that looking for a “master system” is silly and that the true mathematical relationship between all of these things is such a chaotic process that all you can say is that they all stumbled together into the wrong attractor point and things deteriorated from there. This is one of those stories where science has been carefully teasing something apart for many years, only to find out, in the end, that they had it all wrong along the way. Clarity: SCIENCE FOR THE WIN. But — via my confirmation bias — this jumps out as another place where being “certain” about things turns out to be — wait, no — I’m not certain. Dammit. Oh well, it’s just turtles all the way down. A team of researchers with Russia’s Karadag Scientific Station–Nature Reserve of RAS has used specially developed underwater microphones to capture for the first time what they claim to be a human-like conversation between two Black Sea bottlenose dolphins. 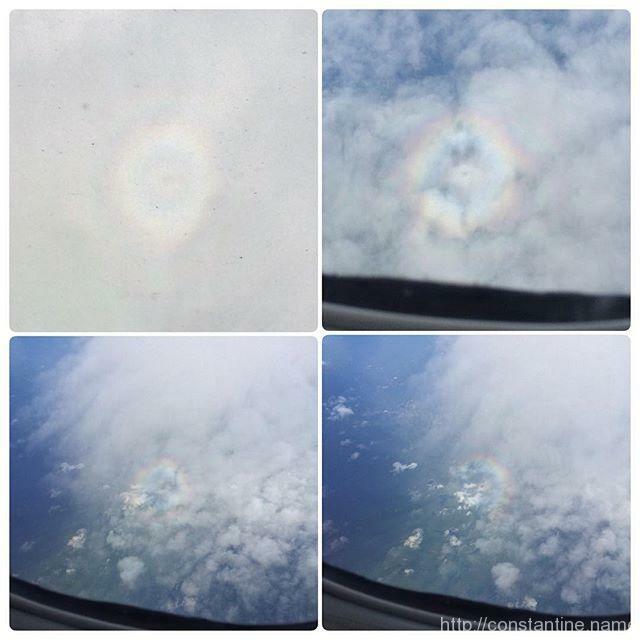 When flying, I love to look for cool optical phenom. This is the best ‘solar glory’ I’ve ever captured. Somewhere between Quebec and Toronto.